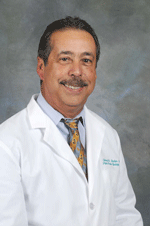 Edward R. Becker, M.D., has been a respected member of Palm Beach County’s medical community for over 25 years. As a charter member of the medical staff at both Palms West Hospital and Wellington Regional Medical Center , he is one of the specialists who have helped set the standard for excellence for physicians and surgeons in our area. He has served as Chief of Surgery at Palms West Hospital for 6 years and was later appointed to the Board of Trustees. He is the current Vice-Chief of Surgery at Wellington Regional Hospital. Dr. Becker is a graduate of the University of Florida’s Urologic Residency program at Jacksonville and has been a part of medical missions all over the world. Dr. Becker practices all aspects of urology including male sexual dysfunction, prostate disorders, bladder disease and control, renal disease and abnormalities, malignancies and kidney stone disease. Dr. Becker is part of a small, select group of urologists in the country who are currently offering mildly invasive treatments for prostate cancer, including HIFU (High Intensity Focused Ultrasound) and DaVinci Robotics. Urinary incontinence is another area of special interest for Dr. Becker and he is proud to offer his patients the latest and most modern treatments available, including the InterStim Neurostimulator and treatment for pelvic floor dysfunction. Dr. Becker is committed to providing the latest in innovative treatments to the community that he loves and supports. Dr. Becker is the founding partner of Palm Beach Urology Associates, and an avid supporter of many local charities including the Boys & Girls Club of Wellington and New Hope Charities.